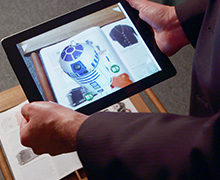 A consumer scans a Hammacher Schlemmer catalog to see a 3-D image of R2-D2. Catalogs are making a comeback — but don’t tell that to Hammacher Schlemmer, whose mailings never went away. The prestigious retailer of high-tech gadgets and unusual products mails about 60 million catalogs each year. The publication debuted in 1881, making it the nation’s longest-running catalog. “There is no [better] mechanism to get your brand in the hands of your prospective customers,” Henry Coleman, the company’s marketing director, says in a new Postal Service video. Hammacher Schlemmer sees its catalog as a companion to its website, where offerings include a voice-activated R2-D2 ($199.95), “the world’s longest backyard water slide” ($2,800) and an amphibious all-terrain vehicle ($49,000). “It’s the digital marketing combined with the catalog that we really feel offers the best opportunities,” Coleman says. The company also is a leader in one of the innovations discussed at the recent National Postal Forum: using technology to enliven mailpieces. Hammacher Schlemmer’s catalog includes augmented reality features that allow consumers to scan pages with a mobile device to see videos, reviews and extra images. “This is an incredible start to the marriage between the physical and the digital,” Coleman says.